Kirk: “Open your eyes and… look at me. No, I don’t think I… will kill you. Although you need killing… badly. That’s what’s wrong… with you. You should be killed and often and by… someone who knows how. By now you’ve probably heard that Amazon has it’s own Appstore for Android. You may have also heard that they give away a paid app for free every day. What you may not know is how to get the Amazon Appstore on your Android device since it’s not available from Google Play. It’s pretty simple. Just follow the instructions below. Go to Amazon Appstore for Android webpage and click or tap “Download now” to download the .apk file. You can download this file directly on your Android device or you can download it on your computer and transfer the file to your device via USB or microSD card. Go to settings by launching the icon on your home screen or from your app drawer. Then in settings to go to “Security”. Then check “Unknown sources: allow installation of apps from unknown sources”. If this makes you feel insecure you can always come back here after and un-check the option. Now use an app like Root Explorer or any file manager to find the .apk for the appstore that you downloaded earlier. If you downloaded it on your device it should be in your “Downloads” folder. If you put it on your microSD card it should be in the “sdcard” folder. If you dropped it via usb it’s wherever you put it. Tap to select the .apk, then tap “Install” on the Package Installer window that pops up. Now the installer will pop up tap install then tap “Open” when it’s finished. Now the Appstore will open. Log in with your Amazon account username and password and start enjoying a paid app for free every day! Scroll down or click continue reading for screenshots. So you’ve got the latest and greatest update to Android, Jelly Bean (4.1) and now you’re trying to install Adobe Flash Player only to discover that Adobe doesn’t support versions newer than Ice Cream Sandwich (4.0). Fear not, Android user, because the Ice Cream Sandwich version of Flash Player works on Jelly Bean and it’s easy to get and install. Go to Archived Flash Player versions on the Adobe Flash Player Help knowledge base. Scroll down and look for “Flash Player For Android 4.0 Archives”. Select and download the first .apk file. You can download this file directly from your Jelly Bean device or you can download it on your computer and transfer the file to your device via USB or microSD card. While you’re at it download the Amazon Appstore for Android too. Now use an app like Root Explorer to find the .apk for flash player you downloaded earlier. If you downloaded it on your device it should be in your “Downloads” folder. If you put it on your microSD card it should be in the “sdcard” folder. If you dropped it via usb it’s wherever you put it. Tap to select the .apk, then tap “Install” on the Package Installer window that pops up. Now the installer will pop up tap install then tap done when it’s finished. How often do you find interesting blog posts, great recipes, funny videos, or web pages that you just don’t have time to view when you find them? How often are you using the same device you found them on when you do find the time to view it? When you find something on the web that you want to view later, put it in Pocket! Saving to pocket is easy, it can be done with a single click, the Android share menu, or emailing a link to the page to [email protected] You can even add multiple email accounts to send to a single pocket account making it possible to add items to pocket from your work computer without installing any applications or extensions. Pocket automatically syncs your saved content to apps for phone, tablet, or computer so you can view it at any time, even without an internet connection. Pocket is more than just an app. It is a cross-platform service which I feel is the best of it’s kind. Try Pocket for yourself with the links below. Since Petiot is a Certified Champion now and so cute it isn’t even funny, General Mills is putting her on the next Wheaties Box! Go Petie my sweetie! I was recently invited to the Xbox 360 2012 Fall Update beta. I’m not going to talk much about the update as it is still in the Beta stage of development. Most of what I’ll blog about today has already been announced at E3 or in press releases. As far as it’s progress is concerned I will say that in my testing I have not found much to be unstable or broken. The console would not auto-log into my gamertag since updating and I was not able to find any way to set “Xbox Companion” to available (Xbox companion is the setting that allows you to connect to the console with the My Xbox app to control the Xbox). The dashboard interface it a little more Windows 8-ish than it used to be but not a huge departure from what it used to be. Browsing the dashboard feels a little snappier when using the Kinect motion controls. The new “Pin to home” feature was pretty nice. basically it’s like quickplay except you can select what you put there. Basically as of now only apps and games can be pinned. A few things would not pin: the system video player, music player, photo viewer, settings, etc. I thought it would be nice to pin those system apps like the music player which I use to stream music from my computer and the system video player which I use to stream videos. I also thought it would be nice to pin settings or the shut down link in there. Internet Explorer is the biggest addition in the update. Since launch the Xbox 360 has been missing something that every other console since the Dreamcast has had: a web browser. The 2012 Fall Update to the console aims to change that. No flash support as of yet. Hulu & Netflix don’t seem work via Internet Explorer. Facebook works. Aside from this website, all the websites I’ve developed work well on the 360. On this website there is a problem with the script I use to create the image reflections. That was broken on chrome when it came out too so it may be fixed. Some web videos don’t work well but you can select for 360 IE to use mobile versions which can serve as a workaround to use h.264 videos instead of flash. The browser works well with USB keyboards and the Xbox messenger keyboard. The messenger keyboard is a nicer experience because you can’t use a USB mouse with the console and switching from the controller to the keyboard or the remote to the keyboard is a little cumbersome. I imagine a lot of those messenger keyboards will be sold after the update. I wasn’t able to use the Xbox companion for smartphones to control the Xbox as I was unable to find any way to activate it on the console. This feature may be replaced by the new SmartGlass features. Then I took another a look at the Call of Duty: MW3 disk. In shrink-wrap, I noticed that part of the Activision logo was cut off. Like it had been cut through with a paper-cutter. I flipped the game case over and noticed the “Mature 17+” ESRB rating looked a little blurred and that it said “For use only with Xbox 360 entertainment systems with “PAL” designation even thought it had NTSC on the front. Not only did I receive the wrong item from this seller, the item I received was COUNTERFEIT! I couldn’t have noticed these things from the seller’s listing because it was a different game and also he used a stock photo. I’ve long been a fan of getting music from Amazon MP3 Store since music is usually a little cheaper there than on iTunes. 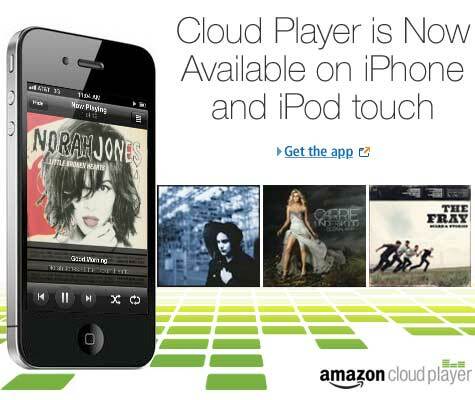 Now you can stream or download music to your iPhone directly from the new Amazon Cloud Player app. If you haven’t tried the Amazon MP3 Store here’s a Free $2 in MP3s (good till 11:59 p.m. on 6/15/2012).